Reinforcement along the eaves and backs of the roofing panels to limit lifting or bending due to high winds. With such a sturdy design, it’s not surprising that vertical roof steel carports are widely recommended for properties located in areas with harsh climates. Hot summers definitely cause wear and tear on metal roofing and siding panels, but nothing beats the destructive force of a tornado or a blizzard that dumps multiple feet of snow. We can choose a thicker gauge of steel to increase both the weight bearing capacity and wind damage resistance of your carport, along with improvements to the frame and foundation to further prevent damage. Since materials that come loose from your carport can damage the rest of your property, you definitely don’t want to cut corners when it comes to building one. This makes vertical roof metal carports well worth the investment. Gable ends, an optional design feature, to give your carport a neater look and improved wind resistance. Unless you’re looking closely to notice the difference in roof panel orientation, vertical roof metal carports may look similar to boxed eave carports. However, all boxed eave carports feature horizontal roof paneling. You’ll see the distinct raised ridges on the panels running along the line of the roof rather than down it vertically. This slows down the shedding of snow and debris. A vertical roof sheds water, snow, and leaves faster, resulting in less weight on the roof and fewer chores in the fall. 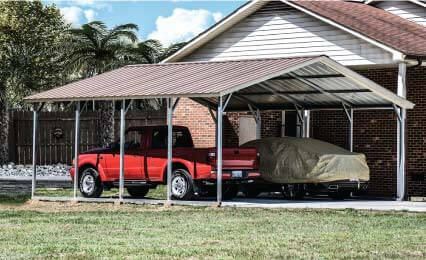 Letting leaves sit on a carport can cause discoloration or corrosion, so choosing vertical roof metal carports is a good way to spend less time on maintenance over the years. Choose from one of our many vertical roof steel carports here at MetalCarports.com or explore our other categories until you find the perfect type of structure.